The paint is hardly dry on the exterior of the Fayette County courthouse. In fact, the interior doesn't even have wet paint. The fishscale slate shingles have only been up a few weeks and the four clock faces have yet to be simonized - or should that be syncronized? Anyway, whatever they do to make the clocks all read the same hasn't been done. 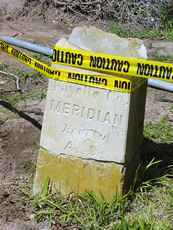 The weathervane arrow is as shiny as a Wal-Mart gardening trowel and townfolk are betting that the Fayette County meridian marker will be hauled off to a landfill by workers who mistake it for construction debris. 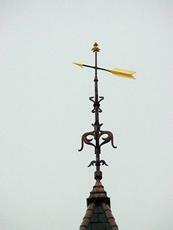 The finials have all been finalized, the fascia have been facialed and the stringcourses have all been strung. The gargoyles have been sandblasted - although they still appear frightened of heights. Not one worker has been reported missing or entombed in wet cement throughout the entire restoration process; so if the gargoyles are supposed to ward off evil spirits - it might be prove they're working. But as for insects - the 'goyles aren't doing a thing. On the day of our visit a swarm of bees was moving in. The clock-simonizers might want to take precautions. If the 'goyles say their job description doesn't include insects - they might be right. Karl, Kasper, Klaus, Otto, Helmut and Hipolito (not their real names) are the courthouse gargoyles. They've been perched here for 113 years, watching generations of Fayette countians pass beneath them. Like James Taylor, they've seen fires and they've seen rain. They've also seen hailstones, floods, weddings, enlistments, parades, the filming of movies and a few things that we won't be discussing here. 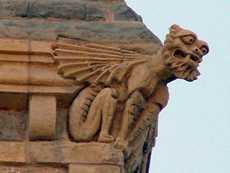 The novelty of having courthouse gargoyles has largely been forgotten by most residents. If people look up - it's usually to get the time - and they seldom notice the six grotesques that are well below the clock. Gone are the days when these bearded bug-eyed creatures were fed ceremonial Kolaches on Walpurgis Night. No longer are the problem children from the La Grange grade school hung by their suspenders from the necks of the four corner creatures. But before I get ahead of myself, I should probably start with how I came to meet Klaus. During a photo shoot for Texas Geographic Magazine, I was climbing a scaffold alongside the building when a gentle Autumn zephyr blew a small cloud of bat guano up my nose. As I raised by head from a huge sneeze - I heard a baritone voice quite near me say "Gesundheit!" I looked up through watery eyes into the stony stare of a pair of deep-set eyes. Since space is restricted I'll spare you my initial disbelief at meeting a talking gargoyle and start with my first question...about a local legend. Klaus: "It wasn't Ralph Nader." JS: "So I'm talking to a gargoyle?" Klaus: "Ja, call me Klaus. But, to correct you, we are called more correctly "grotesques." Gargoyles are decorative vaterspouts that carry vater away from the building - but don't vorry about it - everybody calls us gargoyles - ve're used to it." JS: "Is it true that schoolchildren were once hung by their suspenders from your necks?" Klaus: "Ja, it's true. Vy do you tink they called them suspenders? That's a joke. Ven der kinder stopped vearing suspenders, it stopped too the fun ve vas then haffing." JS: "I can't help but notice a German accent. Are you from Germany?" Klaus: "Germany? "No, ve are all of us from San Antonio." Ve vere carved in das stoneyard of Frank Teich - where we learned German from the stonecarvers. Except for Hipolito, that iss. I think he vas carved by Mexican apprentices. JS: "Well, your accent seems a little..."
Klaus: "Inconsistant?" (laughter) "Hell, I guess I can speak better English than you. I was just messin' with your mind. It isn't everyday we get to talk with someone. Wanna hear my James Mason impersonation?" Klaus: "Bilingual? Schmilingual. I'm a polyglot. About all I get to do all day is study languages. Boy, did I have a time with those Czech verbs! Sometimes when it's real dark I'll fly down to river for a drink - or over to the cemetery and visit with some of the statues." JS: "You can talk with cemetery statues?" Klaus: "Duh!" "You're talkin' to me, aren't you?" JS: "You seem to have a sense of humor." Klaus: "I like to have a little fun if that's what you mean. Look over at the other corner - see that grotesque over there - the good-looking one? - that's me." JS: "What do you mean?" Klaus: "I mean - I'm a ventriloquist - and that's me over there. I bet you didn't even see my lips move." "I say, that's a joke, son." JS: "You're right - I didn't." Klaus: "Don't stare - just look like you're talking to yourself - somebody might be looking up and I don't want you to blow my cover after 113 years." JS: "Uh, Okay. Can I meet the others..."
Klaus: "...are stone. I made up their names - I'm really the only one up here that can answer you." Klaus: "Okay, listen up - I'll talk real slow. I was human once and was cursed. My spirit is now imprisoned in this stone - get it? JS: "For what!? What did you do? Klaus: "I was in the back of a buckboard making faces at my sister and my mother told me if I didn't stop - I'd stay that way." Klaus: "As serious as a train wreck. It's true. Little boys who make faces at their sisters - are changed into gargoyles. But only if their mothers warn them that their faces will stay that way. I didn't listen, so here I am." JS: "But there aren't enough gargoyles..."
Klaus: "I guess you've never been to Europe. It was just my luck to get stuck in Texas." JS: "But why are you the only one here?" Klaus: "Yeah, I was wondering about that myself. I could sure use some company. I guess the gargoyle fairy or whoever put me here forgot about me. I hope they remember me when it's time for me to get out." JS: "So you'll get out..."
Klaus: "Yes, it's not forever. Sheesh, I was just making faces - it's not like I took the Lindbergh baby. I've only got two years left. It all has to do with how many times you were warned - and how many faces you made." Klaus: "Evidently, it was one hundred and fifteen years-worth." JS: "Well, this seems pretty severe." Klaus: "Yes, it's tough, but there are worse things. With more serious infractions you keep a human form but you have a job where you are scorned by your fellow human beings." JS: "Can you give me an example?" Klaus: "Bureaucrats, car salespeople, realtors, receptionists, army recruiters, customs inspectors...occupations like that." JS: "And for the really big offences..."
Klaus: "I think you can figure it out." JS: "You mean lawyers and politicians?" Klaus: "...and certain presidential candidates."